Results from the study show that nonprofit managers need to improve their own and their peers’ strengths in “(1) ability to innovate, (2) ability to surround selves with talented teams, (3) collaboration, (4) ability to manage outcomes.” For themselves, they want ability to participate in cross-sector networks, time to experiment or take a sabbatical. They also want. … “more support, structure and supervision for emerging managers under their direction to take on significant challenges and more opportunities for mentorship of younger executives.” Management leadership development, as opposed to training, involves the potential for mission enhancement and organizational effectiveness, among other desirable outcomes and/or impacts. 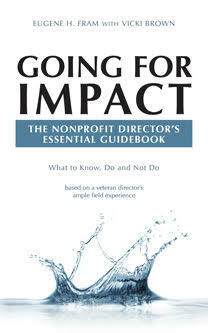 •	Nonprofit Boards Are Conservative In Many Ways: When it comes to investment in assets, programs or leadership boards often look to the bylaws for guidance. They determine that they are often required to maintain the organization’s assets. Investment in management leadership development does not provide an immediate return to meet this standard. ROI may even be hard to judge after substantial investment and time because judging qualitative behavioral outcomes can be difficult. A faith-based nonprofit wanted to hire a program development director but didn’t want to risk one year’s salary in the event the person didn’t perform well. The board applied for a grant from another faith-charity to hire her. She performed extremely well from the outset! I recently encountered a very able CEO, managing an operating budget in excess of $10 million, who wanted support to attend some conferences to keep his skills current. All the board would allocate was about $700 to attend some local university lectures. •	Board Rotations Won’t Help The Management Leadership Cause: Normally nonprofit board members have tenures ranging from two to six years. Many may be dedicated to the organization but are not long-term oriented. Without a continuing meaningful involvement in the nonprofit after meeting their board obligations, their interests move elsewhere. CEOs, in my opinion, have an obligation to develop relationships with their board members, to make certain that board members view their board experiences as meaningful ones. Perhaps over time, some CEOs can develop an informal management leadership advisory group composed of current and former board members. This new group can help him/h or successors to keep the management leadership development issue in front of the board and prospective donors. It will also be useful to generate funds and to develop networking partnership opportunities, for both incumbent seniors executives and emerging managers. Foundation support is critical. Large foundations, like Ford and Gates, have been supportive of management leadership development, at about a $50 million level annually for about 20 years. ** But a consortium of foundations needs to be established with the mission of moving annual total US foundation investment in nonprofit management leadership development beyond 1%, the current level. This can’t happen overnight. ** About $150 annually for each of the 337,000 needing management leadership development.